Your Christmas tree and decorations are all set, children are running everywhere, amazing food is cooking in the oven… There is no doubt: Christmas is approaching ! It’s the best time of the year 🙂 At Fluffy Kitty, we love Christmas and it’s atmosphere. This article is to remind you cat owners of the dangers of Christmas for your little furry friend. This joyful mess probably excites you as much as it does to us. However, you need to make sure your cat is safe. 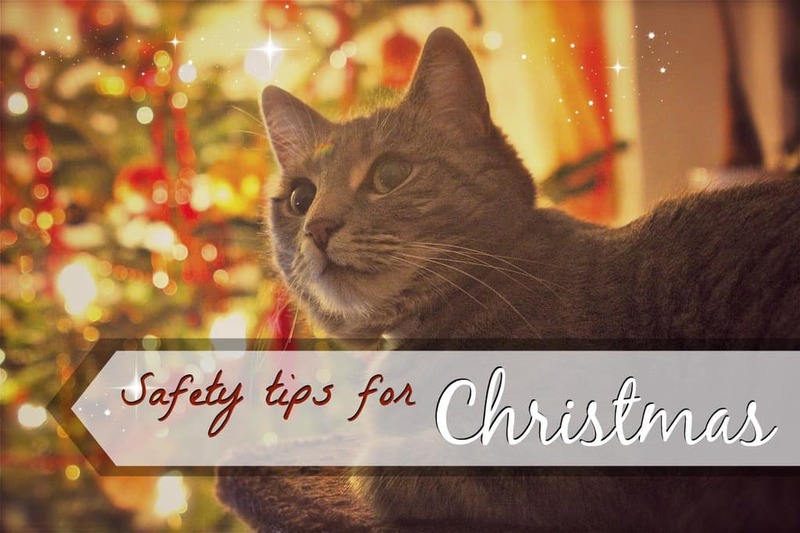 Dangerous decorations and plants, toxic food, stress… Here is a few tips for you to protect your cat’s well-being throughout the holidays. Everybody is coming home for Christmas ? Other animals maybe? As amazing as it is to spend Christmas with everyone, this situation might be a bit more stressful than usual for your little friend. Providing him with his own quiet space where he can run off when needed is the perfect way to treat your cat for Christmas. You know it, cats are very independent creatures and too much noise or activity in the house can disturb their balance. All those plants are extremely toxic especially those with berries. Even out of reach, the risk is that the berries fall and your cat plays and eat them. If it is the case, you are good to go to the vet straight away! Symptoms: excessive salivation, digestive disturbances, dilated pupils, or seizures… basically if you notice your little friend behaves abnormally, he might have ingested a toxic plant. Best is to simply avoid those plants. If you cannot, check out a good way to keep your cat away from your favorite plants. 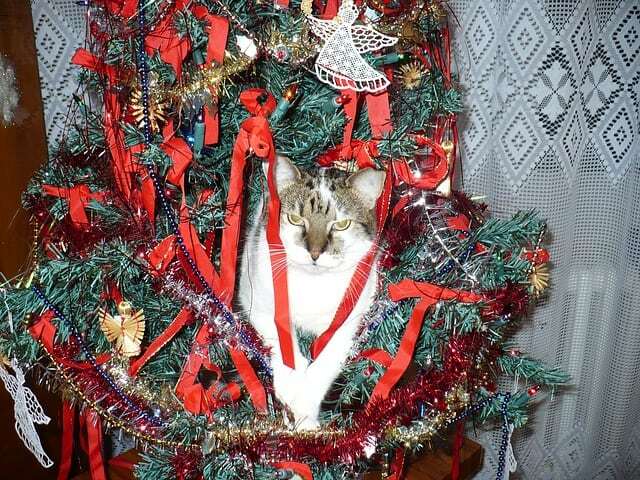 Decorations are maybe the number one danger for your cat. The Christmas tree is not a cat tree but it will not be obvious for your cat who might try to climb it (Yoda did and almost broke everything ^^). You can find solutions to prevent that from happening (check it out here). Also, be careful with small decorations that your cat can reach, play with and ingest. Be sure to attach them properly in order to avoid a big mess in your house and of course to prevent your cat from eating them. Human foods are not always safe for cats ! I know, I know, it’s tempting to give him a little piece of this delicious food, after all he/she is a member of your family! If you want to treat your cat, prepare him something really special, buy him some special treats… Whatever it is make sure it fits his diet. Check out our article on what types of human food is safe for cats. When the time has come to open the presents, keep an eye on the beast. Yoda loves to play with paper, it’s one of his favorite games! If your cat is like that he will surely run in this amazing mess. Be careful with the ribbons, wrappings and other small objects that your cat could ingest. 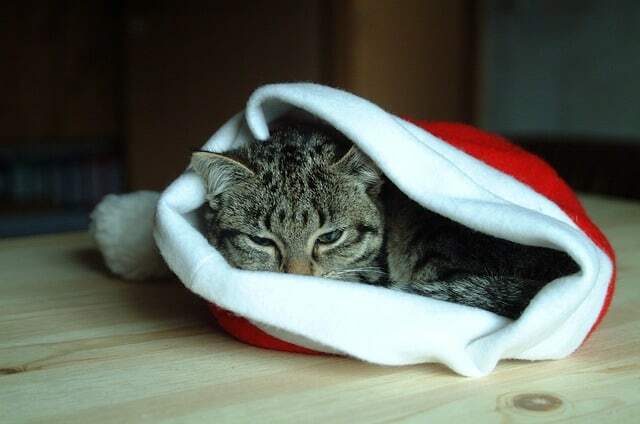 We wish you the most AMEOWZING Christmas! Enjoy the holidays with your furry friend(s). We hope you enjoyed reading this little article. 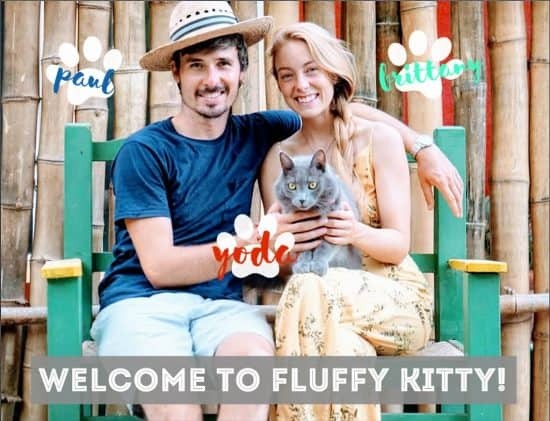 As always, we are more than happy to answer your comments and other questions whether it’s here on Fluffy Kitty or on social media. Please share the love for Christmas with your friends, send them this link to make sure all our furry beasts are safe for this wonderful time of the year. MEOWY CHRISTMAS to you all! 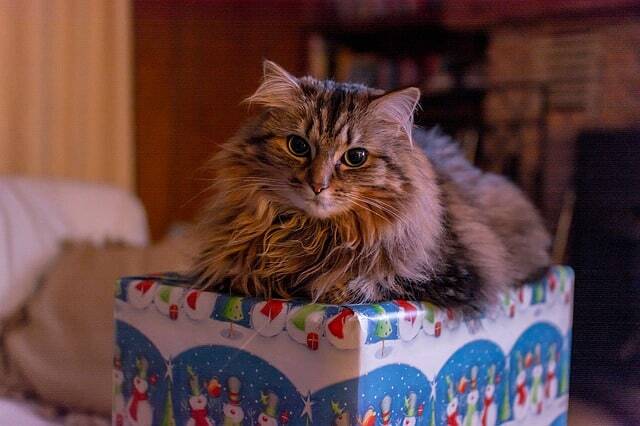 What Are the Best Christmas Gifts for Cats? Is Neosporin Safe for Cats? Previous Post Why Is My Cat Drinking So Much Water ? Next Post What does catnip do to your cat ?